There’s a lot of folks who are horror fans who are not going to like THE INNKEEPERS. And that’s okay. I fully understand that there’s an entire generation that has been brought up on horror film franchises such as “Saw” “Final Destination” “Wrong Turn” and “Paranormal Activity” and while those movies aren’t exactly what I consider horror, I recognize that they have entertained a whole lotta folks. That’s why they’re franchises. And when I’m in the mood I even enjoy watching a “Final Destination” movie myself. Those things are the best live-action Looney Tunes cartoons ever made. But there’s a genre of horror movie that I don’t see much of today that I love and that’s The Ghost Story. Most of them are also Haunted House movies as well since it’s usually a house that the ghosts are haunting. 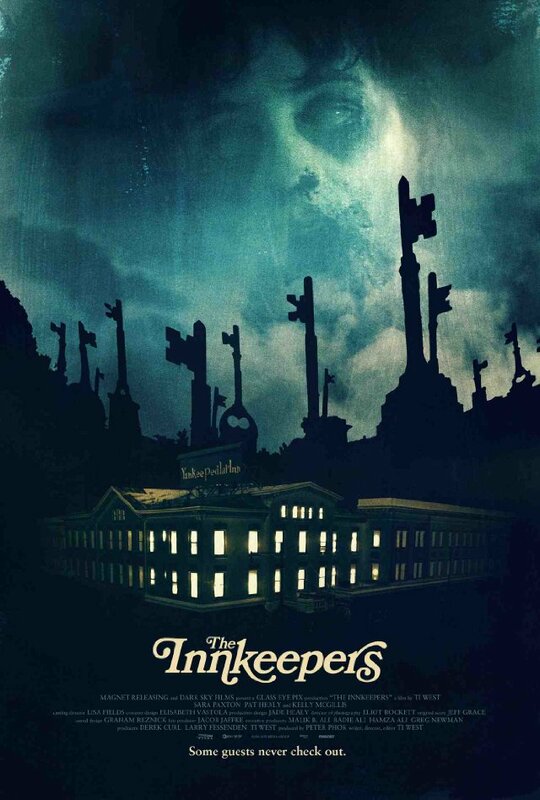 I’m thinking of movies such as “The Innocents” “Poltergeist” “The Shining” “Stir of Echoes” “The Legend of Hell House” “The Haunting” and “The Others.” And now I can add a new one to that list: THE INNKEEPERS. The Yankee Pedlar Inn is going to close in a few days and the owner is soaking up the sun in Barbados, leaving his last two employees Claire (Sara Paxton) and Luke (Pat Healy) to work the place during the final weekend of operation. Both Claire and Luke are amateur ghost hunters and Luke even has a website detailing the history of the hotel’s history of ghost sightings and hauntings. The hotel’s most prominent ghost legend is the one of Madeline O’Malley. She was abandoned in the hotel by a husband who suddenly decided he didn’t want to be married and ran off. Consumed with grief, Madeline hung herself and the hotel owners buried her body in the basement to avoid scandal. Claire and Luke both hope that sometime during this final weekend they’ll be able to make contact with Madeline’s spirit or record her voice. The hotel’s few guests are an odd bunch. 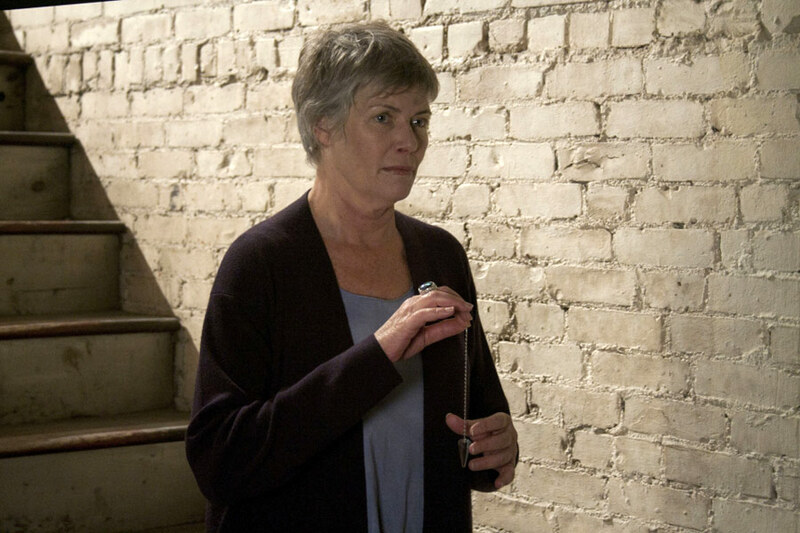 Leanne Rease-Jones (Kelly McGillis) is a former actress who has given up that career to become a professional medium. She’s in town for a psychics’ convention and despite her abrasive personality seems to be the real deal. Or is she just that good of an actress still? There’s a perpetually pissed off woman (Alison Bartlett) with her son (Jake Ryan) who has left her husband and is apparently intending to dump her anger on poor Claire and Luke with ceaseless demands for more towels. And the oddest of the lot is an old man (George Riddle) who insists that he must stay in a room on the third floor. Claire and Luke take turns manning the front desk and looking out for ghosts. Both of them believe in ghosts and desperately want to see one. And as my grandfather used to say: God answers all prayers so it’s on us to be very careful about what it is that we pray for. I really enjoyed how THE INNKEEPERS takes it’s time slowly putting together it’s story. The first half of the movie is mostly Claire and Luke doing their jobs and talking about what they’re going to do when they’re unemployed. Through some really clever dialog and the likeability of the two actors they had me convinced that Claire and Luke are co-workers who have known each for a long time, possibly even grew up on the same street and went to school together. Sarah Paxton and Pat Healy are really good at helping to establish the mood and pace of the movie and in the second half where things start to go wrong I found myself really concerned and worried about what would happen to them. Kelly McGillis was a real surprise for me as I totally did not recognize her and it wasn’t until I was doing research for this review that I found out who she was. The only movie I’ve ever seen her in was “Witness” and before you ask; no, I have never seen “Top Gun” which is the movie she’s best known for. Just based on her performance in this movie I’d really wish she’d do more work in film. Lena Dunham shows up in an amusing scene as a barista who wants to confide in Claire about her love life. In fact, there’s quite a bit of humor in the first half of the movie which makes it all the more horrifying when the haunting begins as I had really grown to like the happy-go-lucky Claire and Luke by that point. Like any good ghost story, THE INNKEEPERS leaves the ending open to the individual’s interpretation of the events they have just witnessed. Is the hotel actually haunted or was everything in Claire’s mind? Is Leanne actually psychic? What did she see in the basement? THE INNKEEPERS succeeds enormously at creating suspense and a feeling of dread without ever showing you anything for much of the movie’s running time. It saves it’s real horrors for when they’ll count the most, as any good horror movie should. So should you see THE INNKEEPERS? If you’re a movie goer who demands buckets of blood and decapitated heads flying at you, or tons of gory CGI effects then I recommend you stay away. This isn’t your movie. And for those of you who demand your movies move at Warp Factor Five with quick cuts every thirty seconds, this isn’t your movie. But for those of you who don’t mind chewing on your horror slowly, savoring a natural escalation of atmosphere and the ambiguity of wondering if what is happening is real or just the result of overworked imagination, combined with some really fine acting, then yes, see THE INNKEEPERS and enjoy. I haven’t heard of this movie until now but I’ll be checking it out. Sounds like a movie right up my alley. 3D blood spatter has kind of turned me off of horror movies. I’ll have to check this one out. Oh, absolutely. I mean, there’s some blood in the movie but it’s not gratuitous and it’s not being flung all over the place along with assorted body parts.